The Mini AV2HDMI Converter is a universal converter for analog composite input to HDMI 1080P (60Hz) output，which provides a good solution to help your old RCA/AV device to the new HDMI equipment. Works great with either 720p or 1080p, the converter has a switch to select the mode. Delivering to a large screen LED HD with more stable and clear images, the AV to HDMI Converter bring you a high-definition immersive experience. Support HDMI 1080p or 720p @60Hz output. -Please connect the power first with the USB cable. -This converter is NOT bidirectional. Only convert signal from AV to HDMI. -AV or HDMI cables are not included in the package. 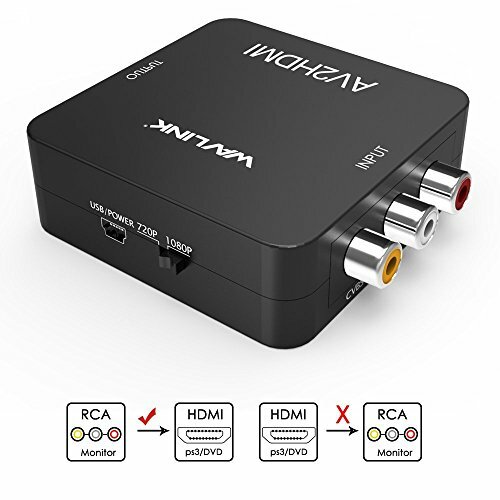 AV TO HDMI ONLY - Advanced universal converters for analog composite input to HDMI 1080P (60Hz) output. Making video come alive, delivering the sharpest, most realistic HD visuals available. ENJOY HD VIDEO OUTPUT - Art Digital Processing Chip: Delivers signal processing with great precision, vivid colors, and ultra clear resolutions. GOOD COPATIBILITY - Support PAL, NTSC3.58, NTSC4.43, SECAM, PAL/M, PAL/N standard TV formats input. Support HDMI 1080P/720P@60Hz output. EASY TO USE & PORTABLE - Ultra delicate user-friendly design;No need to install driver, portable, flexible, plug and play. WHAT YOU GET - Mini AV to HDMI Converter, USB Cable, User Manual,18 months warranty quality guarantee,24h friendly customer service and email support.